The most important requirement is a love of the outdoors and a spirit of adventure. In order to insure that you have an enjoyable hiking experience and do not endanger your health, you should be physically fit enough to undertake exercise that is moderate to strenuous and may include prolonged uphill walking on rough, mountainous terrain. You should be able to complete a hike of 7 miles in about 4 hours, or keep up an average hiking speed of 2 miles per hour. If you take medication for high blood pressure or any other condition, please discuss with your physician the problems that may arise during physical exertion, especially during hot summer weather. Also, consult with your physician about your ability to undertake this type of physical activity. If necessary, consult with a sports medicine doctor. Good footgear. 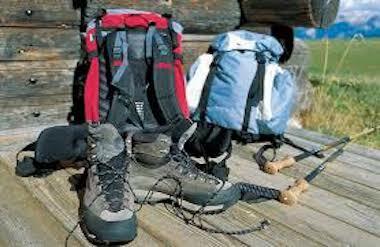 Experienced hikers almost always wear well broken-in boots (see an outfitter like REI or Hudson Trails.) You can sometimes get along with running shoes, but trails can be rough and boots offer better protection. Lunch and water. There are no MacDonalds or water fountains along the trail. Don't skimp on water. Especially on hot, summer hikes, 2 to 3 liters is not too much to carry. Proper clothing. We hike in all kinds of weather. Carry extra items for warmth and to resist rain. Insect repellent. The great outdoors is home to lots of pesky critters, some of which, like ticks, can carry disease. Sunscreen and sunglasses. Protect your skin and eyes against overexposure to ultraviolet radiation, which can be a factor in skin cancer and cataracts. A broad-brimmed hat is also useful.